Pilates burn session over at Pure Pilates Austin this beautiful Sunday morning! They have two studio locations, one in West Campus and the other in The Domain (the location I went to). The class was 45 minutes long and held in a room with 10 of their Megaformer machines. The Megaformer is a great piece of machinery that was created by a man named Sebastian Lagree in Hollywood, CA. 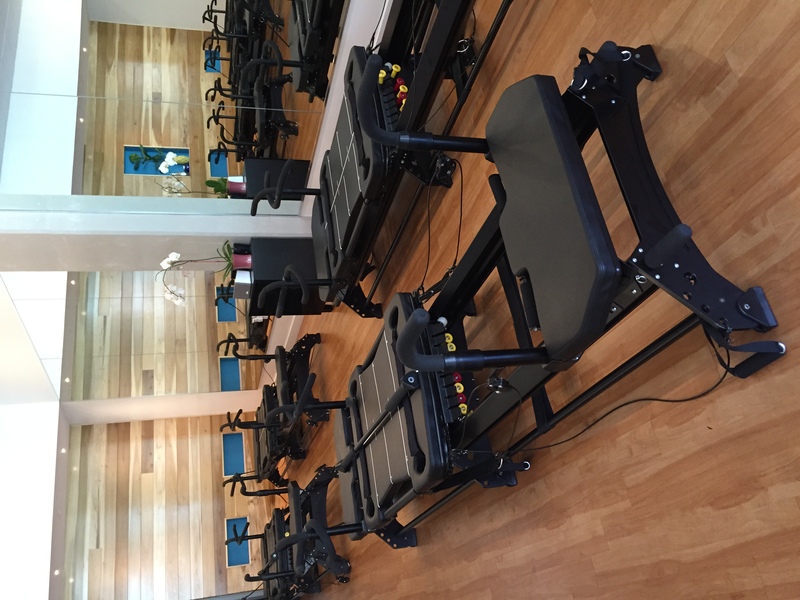 These machines are special to Pure Pilates Austin; they are padded and contain handles to use for stability, as well as different types of exercise movements. You are also able to maneuver the machine to have either more or less resistant based on how many “springs” you apply. There are 8 springs located underneath the base of the machine that contain both yellow and red, which are a lighter and heavier resistance respectively. Each class incorporates strength training as well as cardio intervals to really get the most out of every workout with them. By doing this, you’re not only toning your muscles but burning fat at the same time ( and who doesn’t want that). This take on a classic Pilates class is perfect for anyone looking for a low impact workout. You will be shaking and sweating throughout the entire class but there are no jumps or high impact cardio moves, so you don’t have to worry about injury or joint pain. Although this class incorporates strength training and cardio, it is all based around your CORE. You are engaging your core the entire time, no matter what exercise you are performing. This is absolutely fantastic because everything in life is based around your core! It is important to keep your core stabilized and have those muscles around your spine and underneath your ab muscles working at all times to prevent injury and also give you that tiny tummy effect. You could do crunches all day, but if you do not work those muscles beneath the surface you will never achieve those tight toned abs that you’re longing for. The class was filled with different exercises that worked on your thighs (inner, outer, quads, and hamstrings), as well as your arms and of course your abs/core. Each exercise, no matter what it was, is based off of small precise movements. This kind of class is not about how many reps you can do in 30 seconds or 1 minute. The best results come from slow and controlled movements so you are working on toning and lengthening. Never underestimate the power of these movements, because they may seem harmless but they BURN. And the slower you go, the more intensity you will feel! The studio is always kept very clean, and they have little cubbies for you to keep your shoes, phones, and purses. On another note, the instructors are all so kind! They love what they do, and really know all the right moves to push your body past those barriers to get you looking toned and fit. They are very hands on, and if you are doing a movement incorrectly they will come over and help you to get into the right place so you are really getting the most out of every exercise. Oh, and I can’t forget, you MUST wear socks (either sticky bottoms or not) to the class because they are required in order to use the machines. But if you forget them no worries, they have some for purchase at the studio! This is always a fun and inviting place to go and get a nice workout in and I can’t wait until my next session! COST: $20 session; more pricing; ClassPass Accepted. ABOUT: A high-intensity, sweat inducing, calorie burning workout that combines the basic philosophies of Pilates mixed with a modern attitude. TIP: During the 45 minute signature sculpt classes, the trainers take you through an intense, full body workout focusing on utilizing core strength to tone and sculpt all of your muscles. They move through each muscle group, focusing on Pure exertion.